I can never walk unnoticed around the grounds of SMK Badak. Whenever I make my way over to the canteen or depart for one of my classes, my movement tracked by students: “Hello!” or “Good morning, Mr. Max!” or “Oh! Mr. Max! Good morning, sir!” or sometimes just loud screaming noises. Needless to say, my classes know I am coming well before I set foot in the classroom. 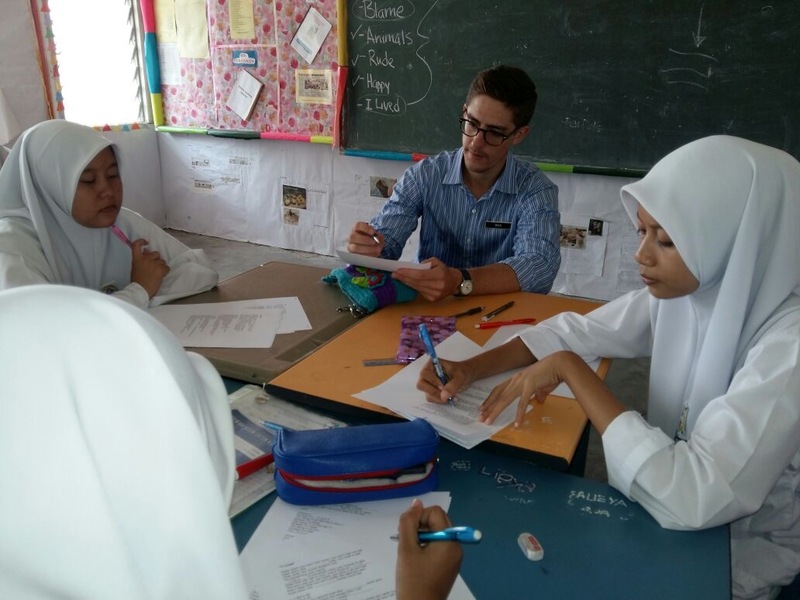 In preparation for my arrival, as is the custom in Malaysian schools, they straighten up their desks, clear their tables, and wait. The moment I step into the classroom, before I can utter a greeting myself, the class has risen to their feet and are addressing me in union: “Good morning, sir!” the class monitor will shout. “Good morning, sir!” the rest of the class repeats. This is how we begin our day. Everyday. Recently, the shouting has decreased significantly. Suddenly, walking from my office to my classes is no longer a similar experience to that of a celebrity walking through a public space. There is just silence. It is quiet. This sudden change is, in fact, is should not have come as a surprise to me.For the next few weeks (an entire month), my students will not consume any food or drink from sunrise until late evening. My students are fasting for the holy month of Ramadan. Although they tell me that they are not hungry or thirsty, I know that most of them are only saying this to comfort me. Regardless of the time of year, my class schedule and curricular requirements have not changed. I am still expected to enter my classes and teach. The past couple weeks have been different. Now, when I walk from class to class I see exhausted students sitting in their classrooms trying to stay focused. As I pass, the click of my dress shoes resonates with them and they turn their head to make sure it is me. As I see their heads turning I prepare myself for a blast of energy, but all I get is a head nod or a wave. Everybody benefitted from this activity. Who doesn’t like listening to music in class? Everybody is tired yet I still need to teach. What can I do to make myself relevant? Even though I am still considered by some to be the “cool new teacher,” that title no longer carries enough weight to automatically focus everybody’s attention on my lessons. My instructional strategies have to adapt to their new reality. I have to remain relevant. So, I decided it was time to be rude. And I am not talking about rude as in impolite, ill-mannered, and nasty. I’m referring to Rude, the insanely popular internationally known pop song by MAGIC!, a Canadian reggae-fusion band (thanks Google). For the first four months of my teaching experience in Malaysia, I heard this song played on the radio at least four times per day. Malaysians love Rude. There is a lot of educational writing out there today about the benefits of infusing music into the language learning classroom. In my experience in American primary classrooms, I found music to be especially helpful during transition times and to subtly control the mood and noise level of my students during learning activities. However, I had never used music as a means to teach language skills. And while I may have been a little hesitant about utilizing such a different pedagogical approach during this time of year, I also realized this was the perfect time to take a chance. When I initially entered my students’ class, most of them smiled and greeted me. But not all of them. So I slowly back pedaled out of the classroom, waited fifteen awkward seconds, then reentered the class. This time they were all on the same page. Brainstorming before diving into the day’s lesson: what are the ways that we can learn English? The list continued on and on. Although I mainly served as the class scribe during this part of the lesson, I occasionally built upon their initial thoughts to get them to extend their thinking. For example, when they said “Reading!” I responded, “What can you read? Tell me more!” These exchanges went on until everybody had the chance to share their thoughts. Together, we were able to generate a list that covered the entire chalkboard. Once the dust had settled, I took a step back and we examined our work. I asked them to look at all of the different ways they could further their English studies. I told them that even though we sometimes think that the only way to learn English is by studying or reading a textbook, there are so many other opportunities to add to their knowledge base. Our conversation was really quite powerful, I could see that this thought had never occurred to some of them. To ensure that the momentum we had just built up was not lost, I walked to the chalkboard and circled one response: “English music.” I then explained to the class that whenever they listen to English songs or English radio stations, they were improving their language skills. As I discussed the importance of exercising different parts of their body that they use when they learn English, i.e. their mouths and ears, I wrote the names of the English songs I had prepared for the day on the chalkboard. “Which song do you want to listen to first?” I asked without thinking. After listening to an entire song without the lyrics in front of them, my students were then given the opportunity to follow along and fill in the missing words. The first time we listened to the song, we did so without any papers or writing utensils in our hands. We simply listened, exercising our ears and bolstering our listening skills. Once the song ended, I passed out sheets of paper with the song’s lyrics on them. 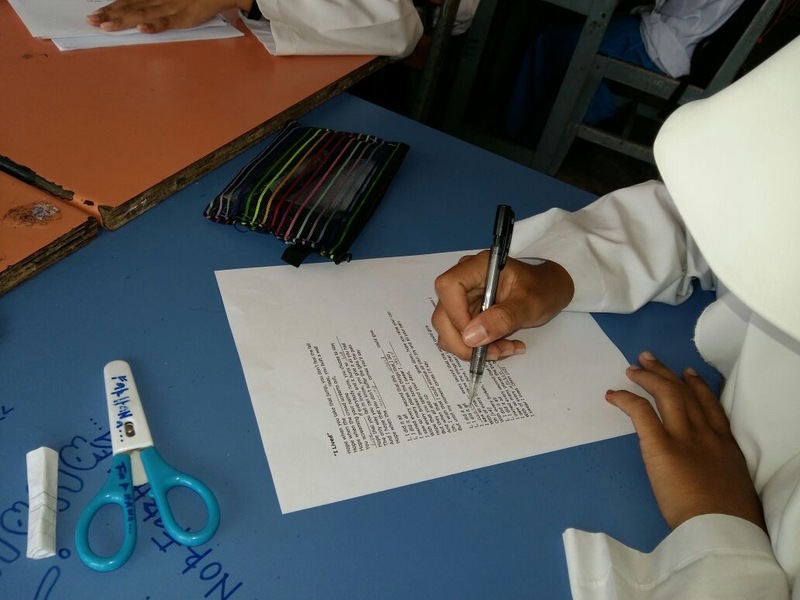 While most of the song’s lyrics appeared on the page, I had removed a number of words to focus my students’ attention and ensure their undivided attention throughout the lesson. After passing out the lyrical fill-in-the-blank worksheets, I gave my class one minute to fill in any of the blanks they knew or had heard after listening to the song the first time through. As soon as the minute had passed, we listened to the song again. This time, the students followed along and filled in the blanks accordingly. The class then had an additional minute to fill in the remaining blanks. I encouraged them to work collaboratively with their table groups. It was inspiring to see them engaging with one another with such energy in light of the heat and the time of year. After the class had collaborated with one another and filled in their lyrics, we read through the entire song together. This was an excellent opportunity for me to check the class’ understanding by ensuring that they were able to correctly fill in the blanks. However, it was also an opportunity for me to point out and discuss the different text features of the song. Music is filled with colloquial speech and figurative language. There is no better avenue to exemplify both of these critically important language features than through music. After listening to and discussing a number of songs, my time was up. This particular class happens to run up until the students’ only recess break of the day so I make a special point to finish on time. As I wrapped up the lesson, I thanked the class for working so hard and exposing themselves to a new way of learning English. But before I could turn and leave, one of the students asked me to stay and play another song. “Yes, Mr. Max! Stay and play another song!” others echoed. I explained to them that it was their recess time and I did not want to force them to stay in my class when they could go do other things. It was a moot point. Their minds were made up: they wanted to listening to more music.